If you don’t like bugs, living or dead, then perhaps you might want to sit this one out. Yoneji Inamura, a resident of Gunma Prefecture, has created some unusual sculptures. This samurai doll of Nitta Yoshisada, according to Naver, was created in 1970. 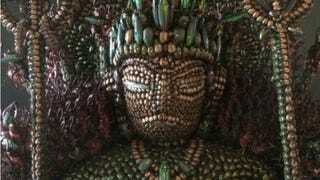 It took ten months to complete and is made from 5,000 preserved insects. The statue was displayed in his home for Children’s Day in May. Inamura was criticized for taking all these insect lives, so he decided to make a statue of a Thousand-Armed Kannon, the Buddhist deity of mercy, and hold a memorial for the dead bugs. The statue is made from different kinds of beetles, including jewel beetles and Japanese rhinoceros beetles. In total, over 20,000 insects were used—which is way more than were used for the samurai statue. This statue, which measure 180 cm including the pedestal, was finished in 1975 and took around five years to finish. Inamura, who is 95 years old this year, hasn’t made any more bug sculptures since. The Kannon insect statue is on display in Inamura’s local town hall.